After more than a decade of research, Intel’s new connector that uses light as a speedy way to shuffle data between computers is finally ready to replace slower copper cables. The MXC optical cables will be first implemented at the rack level and use light and lasers to move data between servers, storage, networking and other computing resources. The cables will transfer data at speeds of up 800Gbps in each direction, outpacing the throughput on copper cables used for networking in data centers. The cables are based on Intel’s silicon photonics technology, which combines optical networking with silicon components. Component company U.S. Conec is now shipping MXC parts, paving the way for distributors to sell cables to server makers and data center companies. Corning, Tyco Electronics and Molex will sell MXC cables. 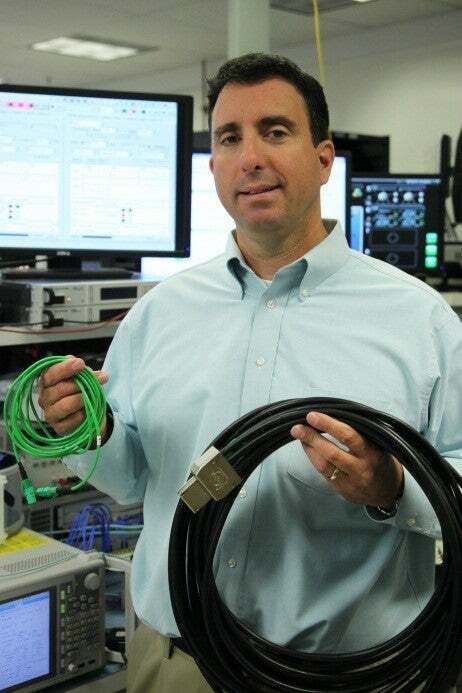 MXC optical and copper PCI-Express cable held by Mario Paniccia, Intel Fellow and general manager of the silicon photonics operations. MXC makes the “connector wars non-existent,” saidsaid Mario Paniccia, Intel fellow and general manager of silicon photonics operations. The cables are smaller, more durable and have a range of up to 300 meters, compared to copper, which can cover only a limited distance, Paniccia said. ethernet is slower per lane and signals could degrade on cables that are longer than tens of meters, Paniccia said. Pricing for the cables was not provided by Corning, which said it would start making cables for end customers in the third quarter. An MXC installation could be cheaper when accounting for the number of copper wires it replaces, said Claudio Mazzali, vice president of technology in the optical connectivity solutions group at Corning. An MXC cable can have up to 64 fibers, with each fiber transferring data at 25Gbps. The fastest cable that can transfer data at 800Gbps in each direction will have 64 fibers. The pricing will depend on the number of fibers in a cable and the distance, Mazzali said. Scaling copper wires in a data center is challenging, Intel’s Paniccia said. “It’s going to be big, bulky, expensive, power hungry and limited in reach,” Paniccia said. MXC could also change the way servers are designed, Paniccia said. The throughput provided by optical connections will allow the disaggregation of memory, storage and processing subsystems into separate boxes. Servers currently have memory and storage limits, and removing those limitations from the rack-level architecture could benefit supercomputing and applications such as databases, which could take advantage of larger memory pools in a dedicated chassis. “The ability to take my memory and stash it a rack away, optical can enable that,” Paniccia said. Fujitsu in November showed the optical fiber technology in use on two Primergy RX200 servers, which were connected to expansion boxes via optical cables. Quanta last year showed a prototype server rack architecture that moved data using optical modules. The technology could also reduce component costs by consolidating power supplies and fans in a data center, Paniccia said. The cables could support existing protocols including InfiniBand, ethernet and PCI-Express. For example, Intel is proposing an Optical PCI-Express (OPCI) protocol for use on optical wires. Support for existing protocols makes it easier to implement MXC in data centers, but servers will need to have a new port designed for the cables. “This is about technology that can plug into standard interfaces and protocols,” Paniccia said. Intel is also opening up the technology so companies can put MXC ports in their servers, and Paniccia is open to rivals like Advanced Micro Devices adopting the technology. Intel is working with the Facebook-backed Open Compute Project with the hope for wider adoption in open server designs. Backers for MXC also include Microsoft, Altera, Huawei and Hisense.